Corteo Peak wasn’t on the radar until this season. Though over the years I’d see it from other mountaintops. It’s easy to overlook the peak when it stands in the shadow of a prominent neighbor like Black Peak. The mountain is easily accessible via Highway 20 and doable in a day. I originally planned on climbing a nearby peak on day two to make the long drive worthwhile. Unfortunately, since the weather didn’t cooperate, I had to settle for just one. I misread the map before the trip, so the pup came with me to the national park. It’s been eight years since I last set foot on the Maple Pass Trail. The 3-mile hike to Maple Pass by way of Heather Pass was a breeze. I got to see Lake Ann from various angles. I got my first look at Corteo Peak from Maple Pass. 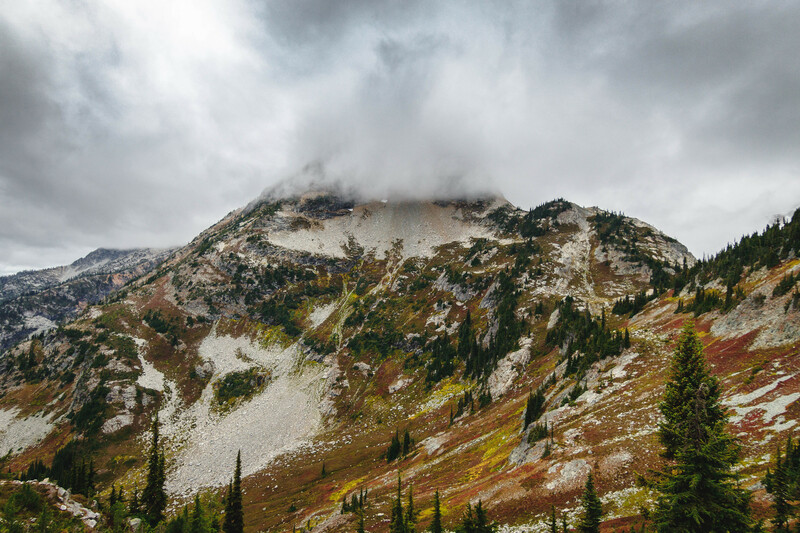 Clouds shrouded the peak as we descended into Maple Creek Basin toward Horsefly Pass. So I had doubts about having views on top. At 6400′, we made a rising traverse southwestward across the large talus field below the east face. Then we attained the southeast ridge at 7000′ via a scree ramp among cliff bands. 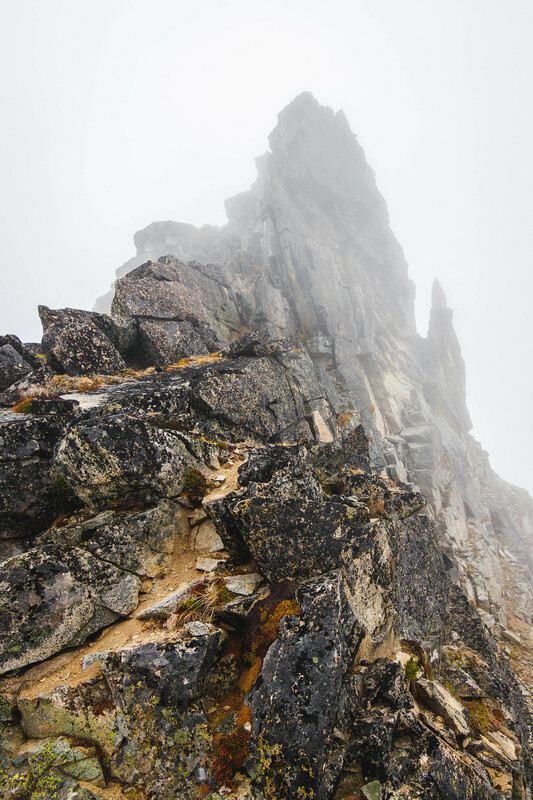 After climbing another 500′ on the steep ridge, we found ourselves in clouds with minimal visibility. At 7450′, we traversed north on downsloping slabs onto the east face directly below the summit ridge notch. For the next 450′ to the notch at 7920′, we traversed westbound with lots of solid ledges and ramps. Terrain comprised the typical Cascades elements–dirt and gravel-covered downsloping slabs and loose rocks, sprinkled with end-of-the-season alpine flowers and heather. Giant boulders had replaced scree at the notch. Of the two reports found, one group went directly up the north ridge. The other bypassed the crest from the west and finished the climb from the southwest. Visibility to the west was virtually nonexistent from this point. Instead, we went up on the north ridge, and it worked out well. There were many boulders with giant steps. But with plenty of good holds and ledges were able to prop ourselves up. First half hour of the summit stay we were still in a whiteout. Clouds slowly dissipated to let out views of the basins below. Moments later, the scenery of nearby high points emerged when clouds retreated entirely. Since it was still early in the day, the pup and I stayed for another hour chewing the fat. A few times we saw Black Peak in its full glory. Otherwise, it remained hidden in clouds. Nice to see some tucked away high points like Mount Benzarino, Goode Mountain, and McGregor Mountain. 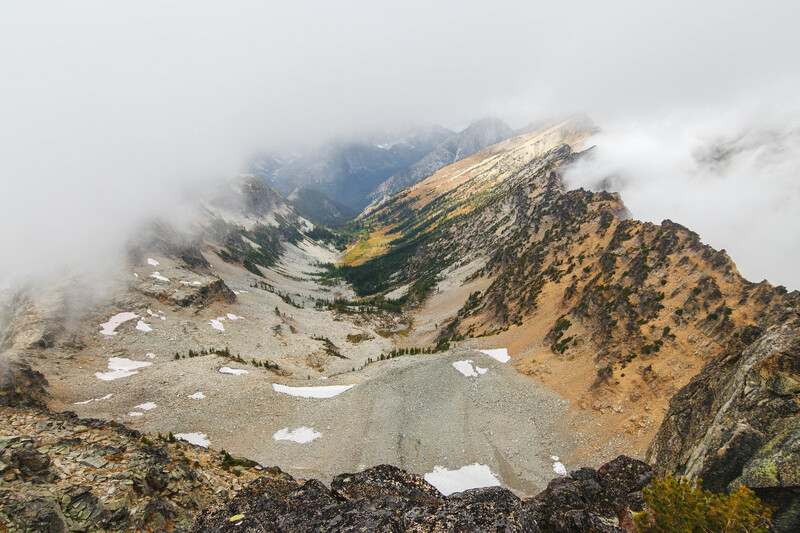 Occasionally, Kangaroo Ridge, Snagtooth Ridge, Vasiliki Ridge, and the Liberty Bell group would show their faces. I caught a glimpse of Golden Horn and Tower Mountain at one point right before wrapping up our stay. Two climbers topped out just as we were getting ready to descend; we briefly chatted. After making it back down to Maple Pass. 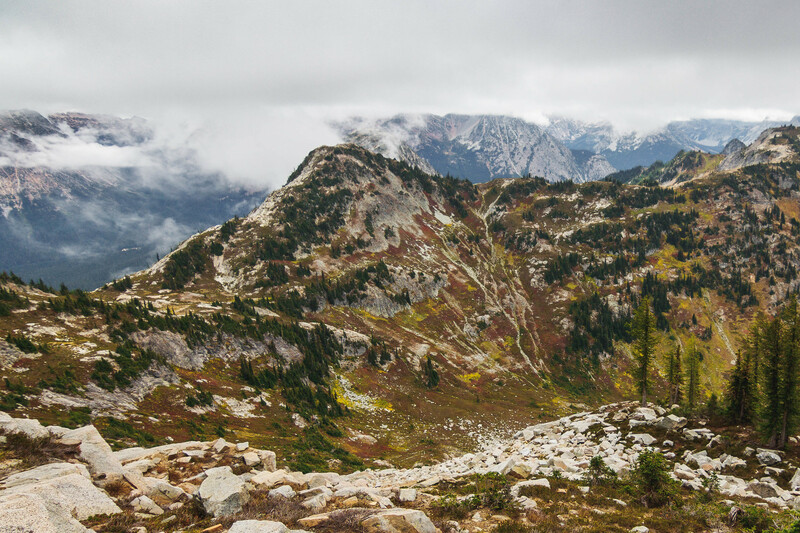 I decided to continue the Heather-Maple Pass loop hike that I had been wanting to do all these years. Glad to see many people on the trail taking advantage of the decent afternoon weather. The four-mile hike from Maple Pass back to the trailhead was very scenic and relaxing. We got to see Lake Ann and Rainy Lake along the way. 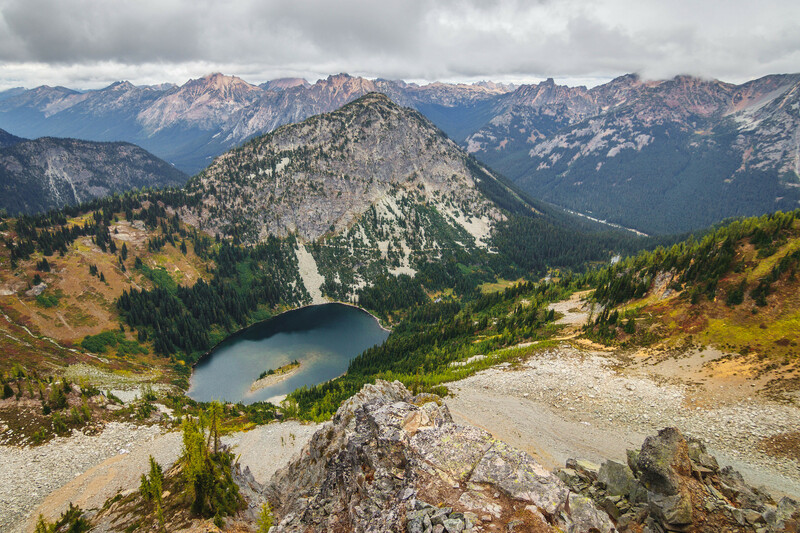 It’s easy to see this being one of the favorite day hiking places in the North Cascades. It certainly lived up to the hype.